A highly practical medium telephoto lens with superb delineation and portability, the Opteka 85mm lens produces sharp and clear images at all apertures. 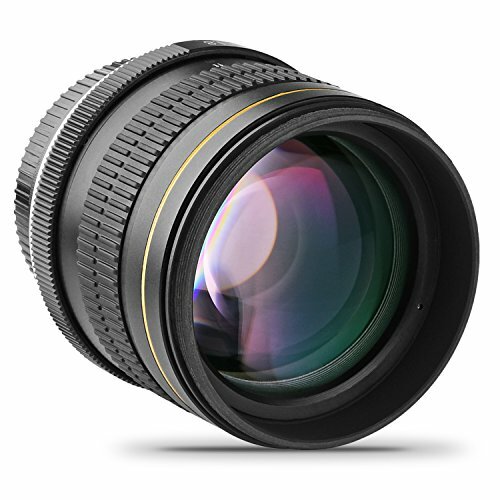 Employing a re-designed optical system that includes Opteka's exclusive HD super multi coating, the 85mm f/1.8 inherits its predecessor's ultra-fast f/1.8 maximum aperture and rounded six-blade diaphragm for superior depth-of-field control and background blur (bokeh). Engineered to inspire new levels of creativity and artistry, the Opteka 85mm f/1.8 will unleash the full potential of your digital camera in the studio or in the field. And because the front lens group does not rotate during focusing, special filter effects are not affected. Best of all, the standard zoom lens with its natural angle of view and perspective, captures the subject plainly, making it excellent for portraits and images that require a natural depth of field. One of the advantages of the Opteka 85mm is its build quality. The materials are glass and metal, there is no plastic used in this lens. It deliberately does not contain any electronics. It is 100% manual. The less parts it has, the less chances that something will break down. Opteka's super multi-layer lens coating reduces flare and ghosting, a common problem with digital cameras and also creates an optimum color balance. Please note that this is a manual lens. It works on both "full frame" cameras as well as the "APS-C" style digital SLR cameras. You can only use the lens in "M" manual exposure mode or "A" aperture-priority mode. INCREASE YOUR CONTROL - With a bright f/1.8 maximum aperture, you'll retain an impressive level of control over depth of field making this an ideal lens for selective focus techniques. EXCELS IN LOW LIGHT SITUATIONS - This f/1.8 aperture setting allows for optimal working conditions in low light. Capture incredible photos in environments other lenses would be lost. MANUAL SMOOTH FOCUS - Since this lens contains no electronics, you can refine your ability to create a perfectly smooth focus down to 2.8'. STATIONARY FRONT LENS ELEMENTS- Because the front lens group does not rotate while focusing, you can easily work with polarizing, graduated ND and other rotational-dependent filter types. ALL METAL DESIGN - Because Opteka has utilized only metal in the 85mm's body design, the lens is incredibly robust and produces an enhanced and accurate tactile response.